Kick off the full @WPT Rolling Thunder Series at Noon today with an $1,100 buy-in, $100,000 Guarantee that is planned to make the money on Day 1. Start with 20,000 stacks and play 40-minute levels the entire tournament. Registration and a single re-entry per player is available through the dinner break, closing when Level 10 starts at about 7pm. Day 1 play is scheduled to end when the money bubble bursts - or the end of Level 19 - whatever comes first. Day 2 begins Friday at Noon. 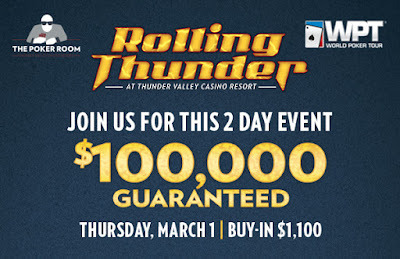 There's a 10-seat-guarantee to the Rolling Thunder Main Event starting at 7pm - 15k stacks and 20-min levels - plus you can satellite in to a Main Event Mega at 4pm for just $100.